Today, we have 103 shops as well as cafés and restaurants, we’ve opened our first three boutiques in Copenhagen and we have a hotel on our working cocoa plantation in the Caribbean. It’s been a busy period of change and growth, but everything we do is still guided by the three basic values that we started with – and it always will be. We’re constantly striving to be fresh, creative and innovative, and always one surprising step ahead. Chocolate starts at the roots of the cacao tree. So we got stuck in. You work too hard for bad chocolate. They work too hard for cheap cocoa. We’ve been raising the bar for cocoa-growing since 2002. Right from the start, we’ve never played by the rules of what people said a chocolate company should be. When we first started making our Easter eggs more than a decade ago, we were advised by experts to make them as thin as possible. We did the opposite, opting for ridiculously thick shells that are still satisfyingly snappable. Everybody said a bar of chocolate should be regularly divided into bite-sized pieces – but squares are boring, so we broke the mould and made our now iconic Giant Slabs, inspired by the shape of molten chocolate when you pour it onto the cool marble of a chocolatier’s table. More recently, we reinvented our smaller Slabs for our Rare & Vintage range, inspired by the crisp lines of pleated fabric to create a unique aesthetic that’s both functional and beautiful. But all this only scratches the surface. We’ve also created the world’s first single-côte chocolate, developed our own chocolate genre, Supermilk, innovated with cocoa cuisine from spiced cocoa nib ketchup to white chocolate horseradish and even cocoa gin, and the invention goes on – we’re constantly embracing new technologies and ideas. We’re one of the world’s few chocolate makers to actually grow cocoa, on our beautiful Rabot Estate plantation in Saint Lucia. Connecting cocoa-growing with luxury chocolate making and retailing makes us unique in the UK, and gives us an in-depth understanding of the factors that impact the final flavour of our chocolate, right from the growing tree. Centuries ago, Mayans revered the potent cocoa bean as a gift from the gods, but somewhere along the way its power has been lost in translation. As sugar prices have dropped, British chocolate has focused increasingly on sweetness. Today, sugar is 20 times cheaper than cocoa, and a typical bar of milk chocolate contains more than twice as much sugar as cocoa. Making our chocolates, our mantra has always been ‘More Cocoa, Less Sugar’. Cocoa will always be our number-one ingredient, even in milk and white chocolate. Most of the world’s ‘chocolate’ is laden with sugar – flip over the next bar you see and check. Our house-grade milk chocolates, meanwhile, are 40% and 50% cocoa, and even our white chocolate is 36% cocoa, well above the average. This balance of cocoa to sugar is crucial: high levels of sugar dull the flavours of the cocoa itself, denying you all those nuanced notes such as citrus, red and yellow fruits, coffee and brownie and masking the quality of the cocoa so that poorer types can be used. We’re also committed to using only real, natural ingredients – nothing artificial, ever. Nature supplies all we need. And it’s not just in our ingredients and the growing of our cocoa that we’re authentic – we also know where our ideas come from. Every month our chocolatiers are hard at work crafting brand new recipes in our Cambridgeshire inventing room for our Tasting Club members. We have a deep sense of fairness that extends to our farmers, our customers and future generations. We believe cocoa farmers deserve respect and a fair deal. Our Engaged Ethics programme has already transformed the lives of many in Ghana and on Saint Lucia – and we’re only just getting started. For our customers, we’ll never put seasonal products into sale before the big day, so that those who buy early can buy with confidence. And for future generations, we’re committed to reducing waste: we use every part of the cacao bean – such as the cacao shells in our teaolat infusions – and we don’t throw out chocolates just because they don’t look quite right. Misshapen chocolates that are still made with our premium ingredients go into our Ugly But Good bags. It’s a question we’re asked a lot, and yes, Hotel Chocolat does have a hotel: the beautiful Boucan on our Rabot Estate in the Caribbean, where we’ve created a unique Anglo-Saint Lucian dining experience with a twist of cocoa. We brought that experience home to Britain too, launching the Rabot 1745 restaurant in London 2013. Our cafés are yet another innovation: bringing together cocoa-growing, chocolate making, drinks and food, we’re reviving the ritual of drinking chocolate alongside a carefully curated menu of tea, coffee and snacks including our moreish brownies. Then there are our Schools of Chocolate. Here we take the appreciation of chocolate to a new level with our Tasting Adventures, and teach you to create your own with our Bean-to-Bar Experiences. You could say we’ve been busy. And we still are, but whatever we’re doing, we know that it’s only possible because of you, our customers. We’ve loved bringing you new ways to experience cocoa since we started out over 20 years ago. Here’s to the next 20. We start selling chocolates online, becoming one of the UK’s earliest ever ‘e-tailers’, predating the likes of Amazon and eBay. The Chocolate Tasting Club is created – a vast community of chocolate tasters who receive unique selections each month. The first-ever Hotel Chocolat shop opens! To realise their dream of becoming cocoa farmers, Angus and Peter buy a beautiful 250-year-old cocoa plantation in Saint Lucia – Rabot Estate. Hotel Chocolat’s first cafe opens in London’s Borough Market, serving a range of innovative cocoa-centred food and drinks. It quickly becomes popular. We launch the world’s first ‘Chocolate Bond’ to fund our development. We raise £4.2 million from enthusiastic supporters, who receive their interest paid in our chocolate! Boucan, our luxury hotel, restaurant and spa, opens on our cocoa plantation in Saint Lucia, to huge acclaim. People start flying in from New York for the food. Hotel Chocolat is voted the UK’s ‘most advocated’ British brand. We love you too! London is chosen as the home for our new restaurant, Rabot 1745, bringing the cocoa plantation experience to Britain. Our resident chocolatiers start making chocolates fresh in our cocoa bar-cafés. The School of Chocolate at Cocoa Vaults opens in Covent Garden, offering a world of chocolate adventures and experiences. Copenhagen sees the launch of two brand new stores, powered by a second Chocolate Bond launch and you, our loyal customers! Our cookbook, A New Way of Cooking with Chocolate, is published, giving a unique insight into the award-winning dishes from our restaurants and allowing you to make them at home. The School of Chocolate opens its doors at our Copenhagen City store, offering new chocolate adventures and experiences in Denmark. Our first West End store opens on Regent Street. Our first ‘refuel station’ café opens in Cambridge. It sets a trend that we later roll out across all of our cafés: there’s a Chocolate Whip Bar, Fuel-Up Station with brownies and snacks, Selector Library and our flavour-matched selection of hot drinks. We list on the London Stock Exchange, and raise new funds so that we can innovate even more. We take home 18 Academy of Chocolate Awards, including three Golds. Hello Hong Kong: Hotel Chocolat launches in Sogo department store – local tastes align with our mantra, ‘more cocoa, less sugar’. Our first ever no added sugar milk chocolate: Supermilk Pure. Simply 80% cocoa and organic milk. Nothing to hide: no artificial sugar substitutes. Whoosh! Instant Gifts by Text launches across the UK. Guests can order gifts using a mobile number, no address required. Their recipient is free to organise delivery at a time and place to suit them. Hello Tokyo! First store opens in Japan, in the country’s largest eco-friendly shopping centre, Aeon Lake Town. 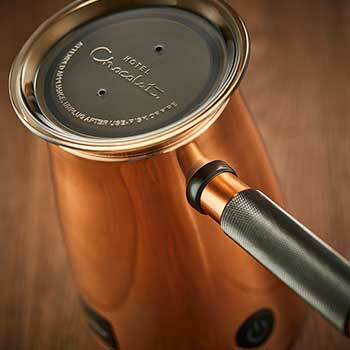 Products land with aplomb: hot chocolate, batons and Selectors are in high demand. New York, New York… We arrive in NYC on Lexington Avenue, Manhattan, our new store opening just weeks after Japan launch. Hot chocolate and batons are an instant sell-out here too. Chocolate Dreams – Inside Hotel Chocolat. Two-part documentary shot by BBC Studios is shown on Channel 5. It goes behind the scenes of our chocolate Inventing Room, Saint Lucia cocoa estate and day-to-day life in our stores.